2018 saw the completion of multiple large construction projects across campus, including the Crosland Tower and Interdisciplinary Design Commons — but several more projects will see work in 2019. Now that Crosland Tower is complete, Price Gilbert will go through a two year renovation and will be occupied beginning in spring 2020. Two separate construction projects are scheduled to begin in late spring. The first of them, the renovation of the Student Center, doubling its size and rebranding it as a Campus Center, is scheduled to begin Phase I of its construction in May or June 2019. Phase I construction of the Campus Center will not affect current Student Center operations and consists of all new construction that includes an Exhibition Hall and three other buildings that comprise the Pavilions. The Pavilions will function as space for Paper & Clay, Healthy Initiatives, the Intake Space and a cafe. Phase II of Campus Center construction, which will replace the current Student Center building, will not begin until summer 2020. The entire project is expected be completed in winter 2022. The second development beginning in 2019 is the overhaul of a nondescript building beside the McCamish Pavilion into the ACC Network Production Center, which will serve to help with the video broadcast capabilities of sports programs across Tech. Other projects are nearing completion. Coda, which held its topping-off ceremony in the fall, is under the final stages of construction and will be occupied beginning sometime in March 2019. On the north end of campus, three separate projects are all expected to finish in the spring and summer of 2019. The Campus Safety Building, located in the southeast corner of 10th Street and Hemphill Avenue, will open in March 2019 and serve as the new headquarters of the Georgia Tech Police Department. 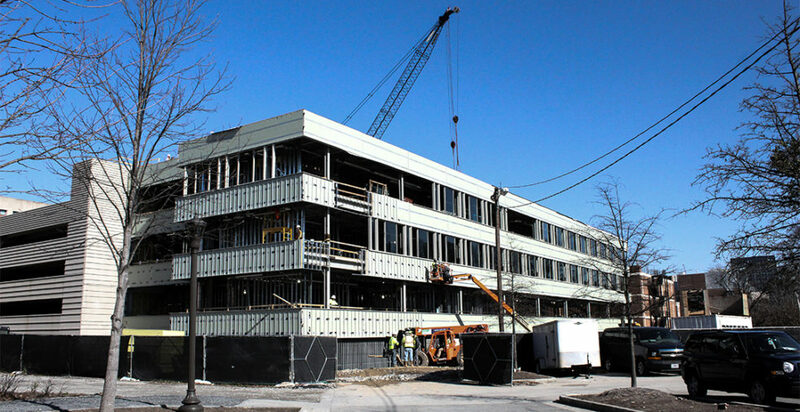 The Kendeda Building for Innovative Sustainable Design, which hopes to become certified under the Living Building Challenge, will be completed in June 2019. The Kendeda Building is located in the northwest corner of Ferst Drive and State Street. After opening in June, Kendeda will enter a year-long process where performance will be monitored and systems tweaked to attempt a Living Building Challenge certification in June 2020. The Dalney Building “combines three seemingly unrelated program elements — a parking structure, an office building, and a biological wastewater reclamation facility,” according to the website of the architects, Eskew+Dumez+Ripple. Dalney will help to expand parking resources on campus. Construction in the northwest corner of campus will continue to cause significant disruptions on multiple streets through spring.